We are an eminent Manufacturer, Supplier and Exporter of Vacuum Combiblock Rinsing Filling & Sealing Machines from Delhi. Rinsing Filling &amp; Sealing Machines we make available are manufactured in compliance with set industrial norms. Bulk orders of the Rinsing Filling &amp; Sealing Machines are processed by us as per the specific requirements of the buyers. Combiblock is a compact three-in-one rotary machine where in Rinsing, Filing and Capping operations have been integrated on a single base frame. 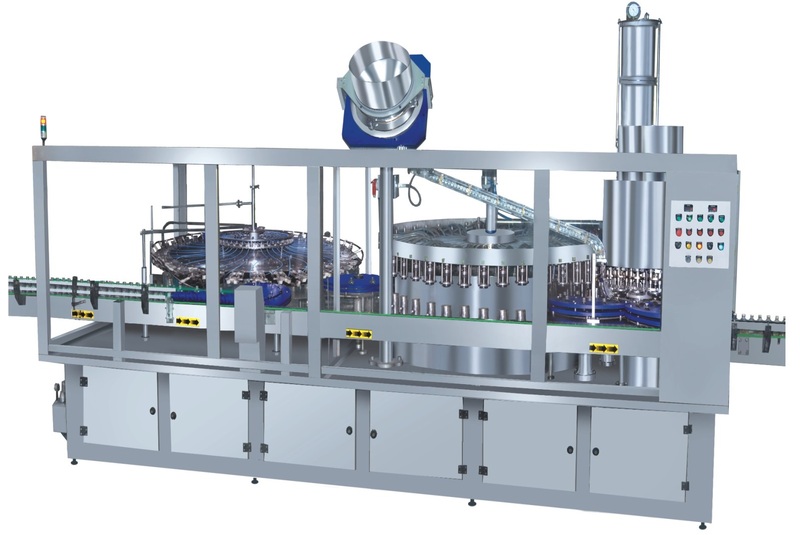 This new concept has been innovated in the interest of users mainly to minimize initial investment, Manpower and reduce length of filling line without sacrificing output and quality. In this Rotary machine bottles are being gripped with specially designed gripping assembles and tilted for subjecting to water or air jet for pre-set period. Immediately after rinsing the bottle are traversed back to their original position and sent to the filling turret for accurate filling with the help of vacuum or by gravity nozzles and finally get sealed in the sealing turret. Depending upon output and application, various models have been developed to rinse, fill and seal non - carbonated and viscous liquid in glass / Pet bottles in the fields of Liquor, Mineral water, juice, milk etc. The models have been suitably designed to handle 180 ml. to 1000 ml. Glass / Pet, Round, Flat or Oval bottles and 25/28 mm. ROPP Caps.